Driving through scenic roads is a common thing among domestic tourists in the United States of America. This is largely true in the coastal towns along the Pacific Ocean in the West coast state of California. One popular scenic road is the 17 Mile Drive within Pebble Beach Resorts (Telephone: +1 866 990 6895) in the wealthy community of Pacific Grove in Monterey County, California, USA. Entrance fees to the gated resort community is at USD 10 per car. One cold morning in September, I found myself along with my brothers and my dad driving around in the 17 Mile Drive which gave us spectacular views of the Pacific Ocean as we drove through the 5,300-acre Del Monte Forest. Note: The roadway of the 17 Mile Drive is marked by red dashes. Markers are also prominently placed along the scenic drive. There are twenty one (21) points of interest at the 17 Mile Drive as described in the Pebble Beach brochure. We stopped at thirteen (13) and skipped the other eight (8). 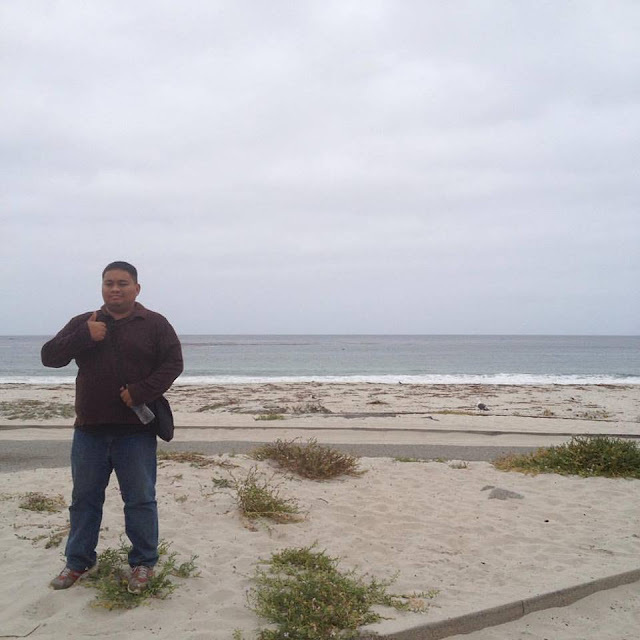 Our first stop at the 17 Mile Drive was at the Spanish Bay, a wide expanse of coastline popular among picnickers. 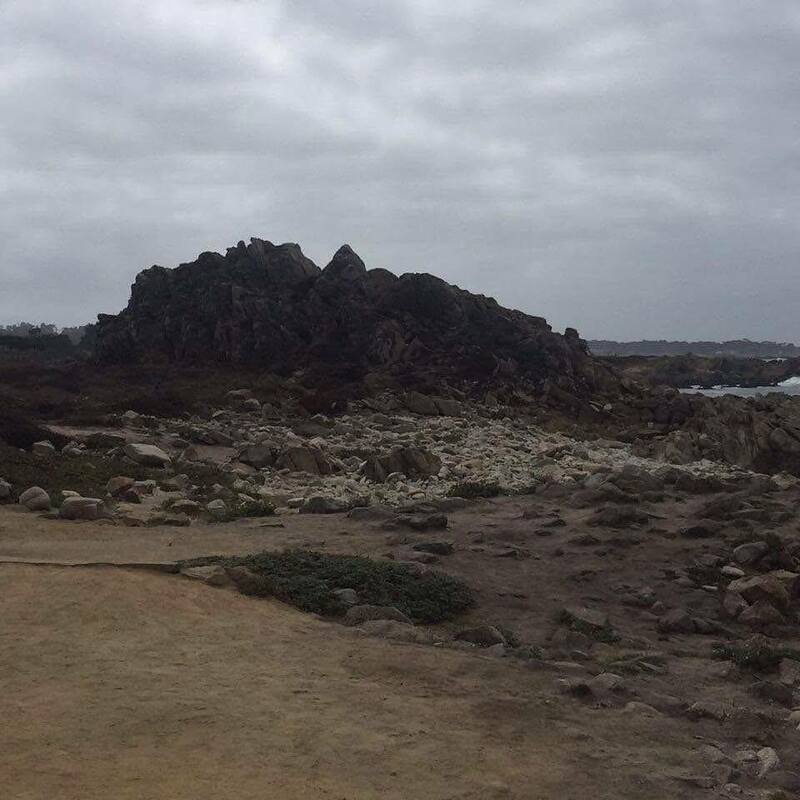 After taking a few photos at Spanish Bay, we headed straight for Bird Rock as we needed to answer the call of nature and it's just the nearest restroom facility we could find. On a rock island off the coast, hundreds of harbor seals and sea lions rest, and occasionally, we also saw some shorebirds. Telescopes on shore can be used to see what is happening on the rock. Note: 2 quarter dollars needed to use the telescopes. After Bird Rock we retraced our trail earlier and stopped at The Restless Sea, so named because of the constant offshore turbulence which was caused by the submerged terrain. My personal note: Some other points off the coast of the 17 Mile Drive seemed to be more restless and turbulent than the waters at the Restless Sea. Not too far from the Restless Sea was Point Joe, believed to be where Chinaman Joe built his home around the 1900's. We had a good laugh here. According to the brochure, mariners from times past usually mistook this to be the entry point to Monterey Bay often crashing their ships on the rocks. China Rock was so named because this was a point where Chinese fishermen used to dwell at in the late 1800's and early 1900's. There is really nothing much to see here. One curious observation though is that the earthwork and vegetation is being conserved and/or preserved and parts of the area are off limits. How I wish there was more information why this was being done so. Another picnic area of note along the 17 Mile Drive is Seal Rock Picnic Area, another white sand beach along the Pacific coast that sure made me miss my native Philippines. Note: Some of the stairs leading down to the area has been cordoned off for safety concerns. Fanshell Beach is a breeding ground for harbor seals who come in spring each year. This area is closed between April 1 to June 1 which happens to be harbor seal pupping season. Note: Fishing off the coast of 17 Mile Drive is only allowed north of Fanshell Beach. While looking out to see from this vista point is just as good, the highlight here is when one looks inland and takes in the spectacular view of a cypress tree forest. Note: Closed April 1 to June 1 each year. Crocker Grove is a nature preserve spanning an area of 13 acres of pine trees and cypress trees, some more than 300 years old. The area was named after Charles Crocker, who established the 17 Mile Drive in the year 1881. 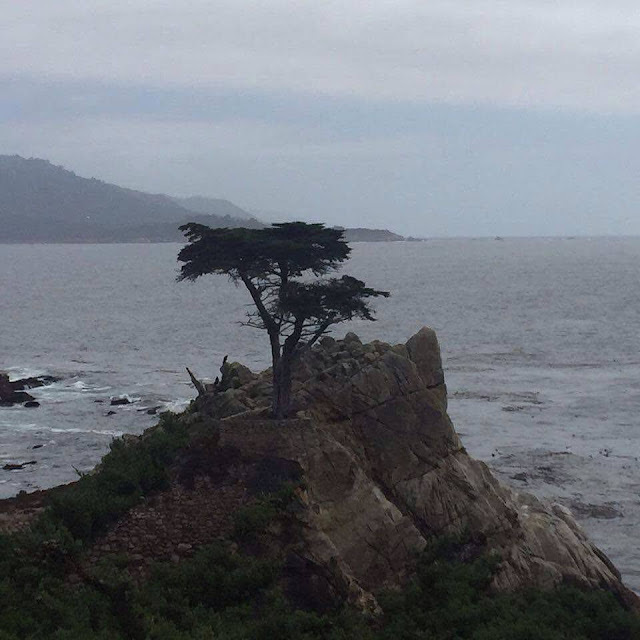 On a rocky outcrop at the coast of Pacific Grove, a lone 250-year old cypress tree stand perched over the Pacific Ocean, a testament to the hardiness of the Monterey cypress tree. Notice how cypress trees are naturally gnarled suggesting graceful sculpting by the wind. The Monterey cypress tree bends to the will of the winds. 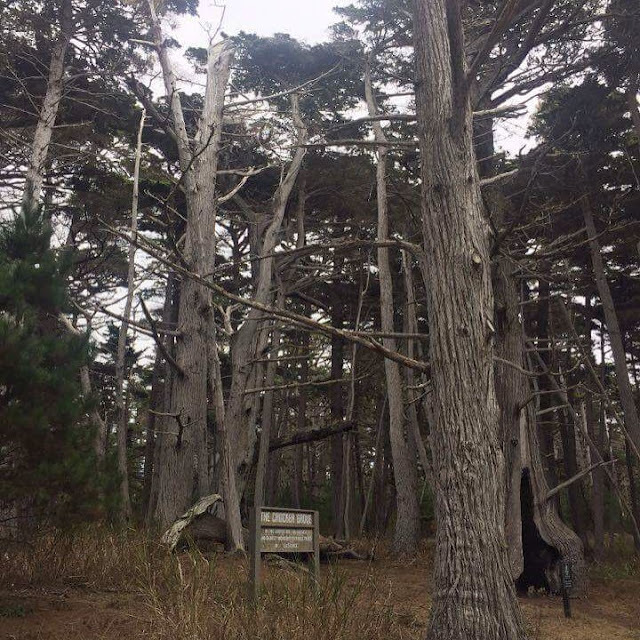 One of these trees at the 17 Mile Drive had it's trunk bleached white from the breeze and now appears with a macabre and deathly aura to it. Not far from the Ghost Tree is Pescadero Point which features good views of Stillwater Cove and Carmel Bay. The Stillwater Cove Beach is a popular destination for beach goers in the area. The last stop of our 17 Mile Drive tour was at Shepherd's Knoll, a vista point that supposedly gives good views of the Santa Cruz mountains and Monterey Bay. Well, trees got in the way. Note: Not to be confused by the gated community with the same name nearby. The one place that I wished we stopped at was Huckleberry Hill which we could have done towards the end of our tour. But everyone was already hungry and we whisked off to Carmel-by-the-Sea and had lunch at Flaherty's Oyster Bar. Huckleberry Hill's name was derived from the fact that huckleberry bushes are abundant in the area which also happens to be among the highest elevations in the Del Monte Forest. None of us has ever played a game of golf our entire lives. So we skipped all golf courses altogether. There are eight (8) golf courses at the Pebble Beach Resorts and one of them was Poppy Hills Golf Course, home to the Northern California Golf Association. It opened in 1986 and was designed by Robert Trent Jones II. The Inn & Links is a world-famous resort and has a Scottish-style links course, the oldest style of golf courses. Owing perhaps to Scottish tradition, a bagpiper closes the course each night. Several shops are also found at The Inn: Spanish Bay Gift Shop, Pebble Beach Shop, Stave Wine Cellar,, Spanish Bay Tennis Shop, Spanish Bay Pro Shop, and Resortwear Shop. Now part of the Shore Course of the Monterey Peninsula COuntry Club, The Bird Rock Hunt Course was utilized by the 11th cavalry for riding and saber practice in the 1920's. It used to be a popular site for the equestrian hunt and steeplechase competitions. A golf course that is open to the public and whose design was inspired by Treasure Island. This course was designed by Robert Trent Jones Sr. The Lodge is described as the heart of Pebble Beach. It was built in 1919 and home to another links course, The Pebble Beach Golf Links. Dining and shopping establishments at The Lodge are Spyglass Hill Pro Shop, The Heritage Shop, Pebble Beach Market, Beach Club Tennis Shop, Pebble Beach Boutique, The Lone Cypress Shop, Pebble Beach Women's Golf Shop, Images of Pebble Beach, Golf Links to the Past, The Men's Shop, Marchesa Jewelry, The Lodge Gift Shop, The Kids Shop, and The Robert Talbott Shop. Note: It was in 1919 that Samuel Finley Brown Morse started Pebble Beach. He is not to be confused by Samuel Finley Breese Morse, the inventor of the Morse code. Momentum, the monument dedicated to the 100th US Open Championship is located at this public golf course named after Peter Hay. The 30,000 pound bronze sculpture was a masterpiece of Richard MacDonald. If we had more time, this would have been an exciting stop learning to ride horses and riding horses through trails. One vista point that was not listed on the Pebble Beach brochure was Sunset Point. Have you been to the 17 Mile Drive in Pacific Grove, California? What was your favorite stop? You may tell us in the comments below.